It is extremely important to choose the right kind of surfboard based on your surfing skills and other important factors that are going to be discussed in detail below in this article. Only the right kind of surfboards will help you gain a fun-filled surfing experience or else you’ll either tire out or your surfing experience will not be as much you would’ve expected. In this article, we’ll be looking to the major factors that need to be considered while buying a surfboard along with the types of surfboards and the best places to buy surfboards and who makes the best surfboards and a lot more. Who makes the best Surfboards? A surfboard is a long and narrow platform made either using wood, plastic or fiber is used in the sport of surfing. People use these boards to ride along the waves that come in towards the beach. These boards are incredibly light and are strong and sturdy to support the weight of a person standing on it while riding a wave. Originally invented in Hawaii, now these surfboards have undergone huge changes with lots of improvements including the fins on the bottom of the board. The fins purpose is to assist in directional stability along with many advancements in shape and material used in the construction of the boards. Surfing is a great workout that helps in strengthening your legs and also helps in developing your body in a great way. It also helps to lose your weight easily, as according to a recent survey conducted from HealthStatus.com, a person weighing 180 pounds can easily burn a maximum of 260 calories if he surfs for just an hour. Surfboarding also helps in strengthening your shoulder muscles along with your back and also to gain a strong core. It also improve your balance to a great extent as surfing is all about maintaining your balance to stay on the surfboard for as much time as possible. It is also an excellent cardiovascular activity as most of the time involves paddling that involves your upper body and provides a core workout for your body. It is all about being out in the sun riding the waves and this helps in getting a lot of Vitamin D that helps in growing stronger bones and also to regulate the growth of skin cells. It also allows you to sleep peacefully and good sleep provides the needed time for your muscles to relax and repair themselves. Click here if you want to know some tips on how to surf better for beginners. Shortboards are ideal for surfing in fast and steep waves as they are highly maneuverable and comes in sizes from 5-7 feet. These surfboards come with a pointed nose and narrow rails and are specially designed for professional surfers riding on huge waves. Longboard surfboards are those that come in sizes of 8-11 feet and is ideal for beginners who are new to surfing as these boards are easy to paddle and to catch waves much quicker than a shortboard. Since they are long it is easy to walk on the board. Click here for our review on the best small wave surfboard. Funboards are also suitable for beginners as they come with a wider design and offers a lot more stability than the shortboards and longboards. These boards come in sizes of 7-9 feet long and is also ideal for heavier surfers as they are easier to maneuver. The hybrid surfboards are boards that are designed combining the design of both the longboard and the shortboard. Hence these boards come with increased volume and is ideal for heavier surfers. This type of surfboard is specifically designed for people looking for speed that is required to surf in huge and high-intensity waves. These are best suited for professional surfers and offers extreme control to the surfers with a narrow tail and pointed nose. If you are an intermediate to advanced surfers looking for a suitable surfboard for your skill level, you can view more details here. It is important to understand your skill level and buy a surfboard based on it. If you are a beginner, then you need to go for a board that provides you with a lot of stability and increased volume. Try using soft top boards as they are perfect for beginners as these kind of boards offer a lot of stability and float and goes easy on the body too. Once you become comfortable with surfing, you can scale down on the size of the board and go for a fiberglass board. When it comes to choosing the best surfboard, your fitness level also plays an important role. The more fit you are you can go for boards that are smaller, typically a fish surfboard because it allows you to easily maneuver along the waves and have a lot of fun. Another important factor that plays a major role in choosing the right size of a surfboard is your height and weight. 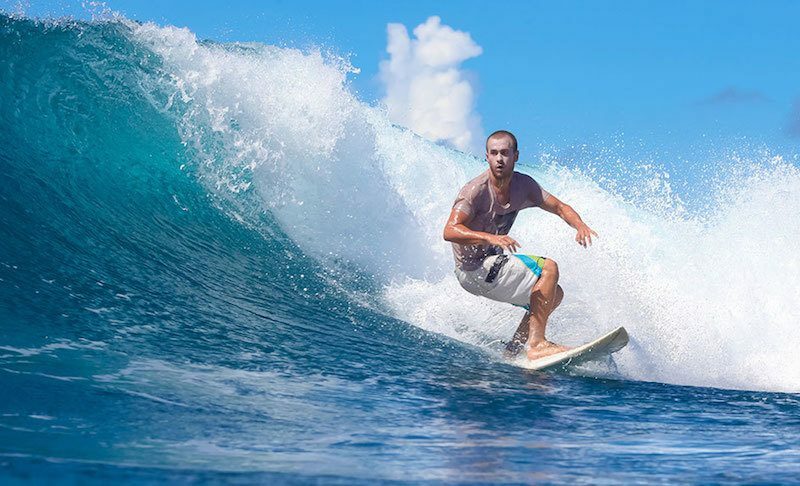 If you are overweight and looking to burn some calories by surfing, then you need to go for longboards or hybrids that offer more stability and carry your weight. Age also plays an important role and choose the right board depending upon your age along with your height and weight. Of course, your surfboard wouldn't be complete without a travel day bag for your easy transportation. Surfboard travel bag helps to protect your surfboard from dings and scratches, and also works well as a home storage. Surfboards are available in many online websites along with your neighboring stores. But if you are looking for the best place to buy your surfboard and other accessories, then you can check out some these websites that offer Surfboards in various sizes and types along with lots and lots of surfboard gears and accessories. You can find surfboards for all ages and in all budget ranges. 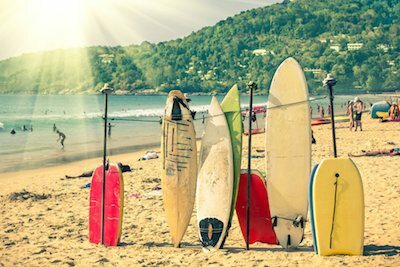 If you are looking for a shorter board instead, check out our article on the best body boards.